1. Remove all but the innermost layer of the husk. The kernels should be covered by, but visible through, the innermost layer. 2. Use scissors to snip off the tassel (long silk ends), at the tip of the ear. 3. 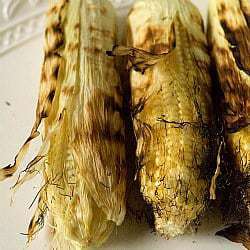 Grill the corn over a medium-hot fire, turning the ears every 1½ to 2 minutes, until the dark outlines of the kernels show through the husk and the husk is charred and beginning to peel away from the tip to expose some kernels, 8 to 10 minutes. 4. Transfer the corn to a platter. Carefully remove and discard the charred husk and silk. Season the corn with salt and pepper to taste. Serve immediately with butter, if desired.